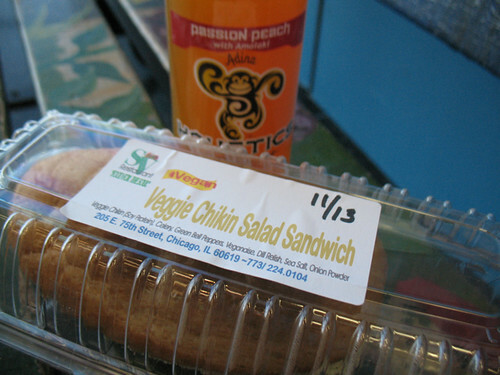 Vegan on the Go: O’Happy at O’Hare! Initially I was a little confused as to why that banner was there – it was on one of those closed-off, in-construction type areas where they were obviously building a new eating establishment, so originally I thought it was saying that this was a “coming soon” type of thing. But then I realized that it was right across from the actual/current location of Cibo Express, so I realized it was an advertising tactic. Anyway, it worked – I could not resist investigating a vegan option! Not being a Portland native with vegan options hitting me in the face every time I turn a corner, I still get giddy and excited whenever I see the word VEGAN in the rEaL wOrLd. I purchased this at 7:30 in the morning on my layover in O’Hare, thinkin’ I’d eat it on my flight from Chicago to Madison. For some reason the idea of a “chicken” salad sandwich, as boring as it might seem, was really appealing; since it was early, I didn’t want anything too spicy. But the Chicago-Madison flight is so short – and I was so busily knitting – that I didn’t end up eating it until I was back home, maybe around 10:45. Still, it was reallllly tasty, totally like the chicken salad of yore. My only complaint was that the bread was a little soggy, but maybe that’s because it was sitting in my giant purse for two hours. Oops. The iced tea was also delicious; I’d never seen that brand before but I enjoyed it; it was subtly flavored and very refreshing. Anyway, that’s all for the moment – I’m quite exhausted after this trip! * I still have one more on-the-go type post to share, but I’ll save it for later. And now I need to catch up on all the awesome MoFo posts I undoubtedly missed during the past few days – don’t be surprised if y’all receive boatloads of random comments tonight! 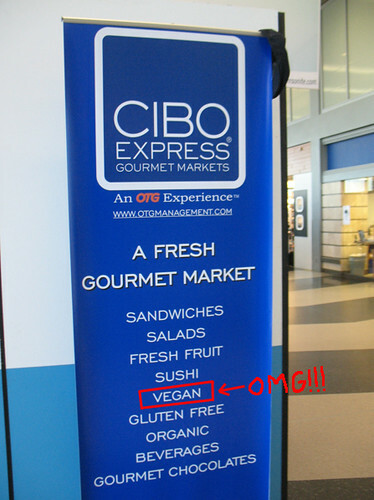 Have you ever found a surprise!vegan option at an airport or similar travel-type location? * Proof: I originally typed “O’Hair” instead of “O’Hare” in this post. The Irish version of Hair, perhaps? Now I’m picturing lots of freckly redheads running around nakie and singing hippie songs. Hee hee hee. The Detroit airport has vegan options, too?! I practically LIVE there! Now I’m excited for my next layover… hahah! Thanks for the tip! Crazy! Airport are about the least vegan-friendly places I can think of, so this is amazing! I wish that JFK would get on board with the trend next… I usually fly out of there when traveling, and there’s less than nothing to eat, even if you aren’t vegan. Geeze, you’d think a crazy-busy airport like JFK would have lots of options! This excites me greatly, since this is my airport and I travel frequently. Either this is somewhat new, or I’ve been in the wrong terminal, because I have never seen this! 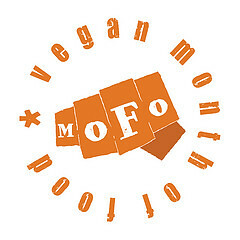 I recognize that Soul Veg logo, love them! I have still never been to their restaurant on the south side of Chicago, but they sure are making a name for themselves by having their food available at festivals and whatnot, and now the airport. Amazing!!! Ooh, Soul Veg! The sticker on the label was so tiny I could barely read what SV stood for. Wow – I am so excited to see that the word “vegan” was actually listed with pride on the menu. Awesome. I’m so glad to hear that my post helped! I hear you – traveling on an empty stomach (especially while watching other people chow down on airport food) is awful.